Grand mal seizures are caused by unusual electrical activity of the brain. Our day-to-day activities like thoughts and emotions are produced by electrical impulses that stimulate nerve cells in the brain. For the duration of seizure, the regular electrical communications in the brain get disrupted. Grand mal seizures are also called the symptoms of brain dysfunction. This brain dysfunction can cause a wide variety of diseases or injuries. Metabolic imbalance, stroke, ingestions of toxic substance, brain tumor may be the result of seizures. The Grand mal seizures have two stages the tonic phase and clonic phase. In the tonic phase the patience feels lack of consciousness, muscle contraction and subsequent rigidity. The clonic phase results in violent shaking or hallmark shaking. Color of the skin also gives an idea of grand mal seizures. The grand mal seizure gives bluish tint in the skin. Following the seizure a person may experience period of fatigue and headache. Blood tests are recommended to find out metabolic abnormities. If seizure is caused by fever or a change in mental status, doctors immediately perform a spinal tap to detect any infection like meningitis and encephalitis in spinal fluid that might have led to grand mal seizure. There are more such testing is required but that depends on whether or this is the first episode of seizure. If this is the first episode without indicating any clear cause, extensive testing is recommended. Grand mal seizure tests include skull x-rays, EEG, CT scan, MRI and a cerebral angiogram. 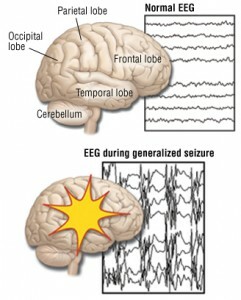 Usually the first grand mal seizure does not require any treatment, but a regular medical consultation is good to ensure that epilepsy does not build up. Periodic grand mal seizures are generally treated with anticonvulsant drugs used alone or in combinations. The drug helps in lessen the regularity of seizures. Medication is the first treatment for seizure and if the next seizure does not accrue for two or three years, the prescribed medication can be reduced or permanently stopped. If the medication is not effective, which is a rare case only, and the grand mal seizure is caused by the brain damage, usually in the temporal lobe, surgery is done. Electrical stimulations are also performed to interfere with abnormal electrical activity. Other than the full medical care there are some complementary treatments too, that may help in dealing with grand mal seizures. These treatments are also referred as alternative therapies which are not meant to substitute for full medical care. These alternative therapies may include yoga, massage therapy, acupuncture, meditation, etc. Grand mal seizures, when occurs only once, it is taken as a common phenomenon as it never leads to major complications. Recurrent seizure, however, may create complications and profound impact in the patience’s life. These complications can be serious if not treated properly. They can be life threatening for some cases. You can help minimize the risk of serious complications caused by grand mal seizure by giving the patience professionally designed treatment plan especially for them. The most effective and best way you can actually help your self get ready and accept grand mal seizures is by reading and mastering much more about them. So take a look at more articles on our grand mal seizures website.